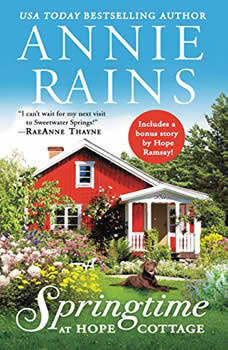 Fans of RaeAnne Thayne and Debbie Mason will want to cozy up with this small-town series from USA Today bestselling author Annie Rains. When opposites attract...As an editor at a major New York City magazine, Josie Kellum is always on the go...until an injury sidelines her in the small town of Sweetwater Springs. Luckily, her new physical therapist is easy going and easy on the eyes. When their sessions start to heat up, in more ways than one, Josie is intrigued. But she has a city and career she loves waiting for her. So why does the thought of leaving him suddenly feel a lot like leaving home? Tucker Locklear is just starting to move on after his wife's death. While he can't deny his attraction to the gorgeous, vivacious Josie, he won't risk the pain of losing someone again. The sooner he gets Josie back on her feet and back to her real life, the safer he'll be. But in Sweetwater Springs, love has a way of mending even the most damaged heart.